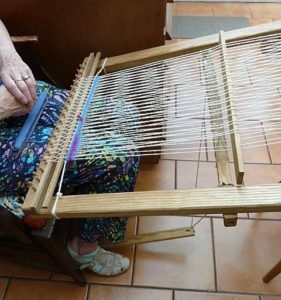 It was while a was recovering from a broken leg in 1967 when I could not weave on a four shaft floor loom that I started looking at a smaller device. 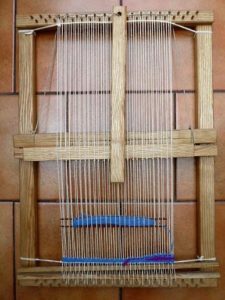 I wanted a loom which would enable me to have both hands free to weave and to operate a shedding mechanism by an underslung heddle and treadle system. I also incorporated continuous warping through a series of pegs at the top and bottom bars. The construction is reasonably straight forward requiring some wood working equipment and skills. The basic frame and all the associated parts may be made from the same type of wood. I have used Ash, which is nice and straight but whatever wood is chosen it must be well seasoned. Oak or other hard wood is to be recommended whilst a quality soft wood will suffice. 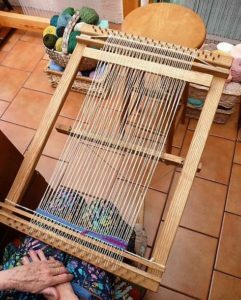 Whilst the size of the loom and the associated parts can vary it is important that it is not too large to make weaving difficult through over stretching. The sizes of the wood sections may be varied and adjusted to that which is available. It can be used with a wide range of warp threads from fine linen to coarser strings. The number of warp threads per inch can be varied to suit the textile to be woven. 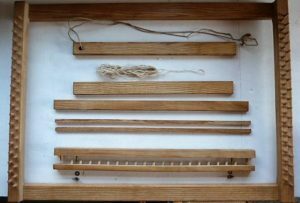 The “cutting list” is for the size of the loom shown in all the photographs. All sizes are measured in centimetres. This is the most difficult piece to make as it requires a groove down the centre of the one piece. See photographs. Leashes approx. 18 each made from 37cms thin cotton cord folded and knotted. One piece of strong cord for the foot treadle. Approx. 100 x 6mm Dia. 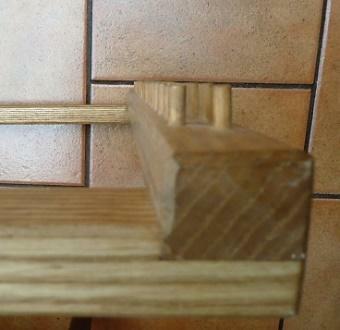 x 2.5 cms long Dowels for top and bottom bar and Heddle holder. These can be purchased in a variety of lengths. Make sure that the wood to be used is straight grained and well-seasoned. Lightly sand paper to remove any sharpness on the edges. Start with the main frame. Check carefully before any cutting to length. Check the wood is squared. Only a small shoulder is needed say. .5cms. Before assembling I next complete the top and bottom bars by adding the dowels which will take the warp threads. 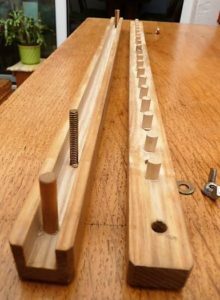 The above image shows the lay out for the dowels which go all the way across the bar. Mark off their positon. There is a dowel every 2.5cms (1 Inch) on the bottom row. In between is a dowel at 1.25 (1/2 inch). They are spaced like this to avoid splitting the bar and for ease of warping. Carefully drill a suitable sized hole for the dowels diameter and at a similar depth. The depth to drill should allow for the dowel to project from the surface by approx. 2.5 cms. If possible use a drill stand or similar to ensure they all the same depth. 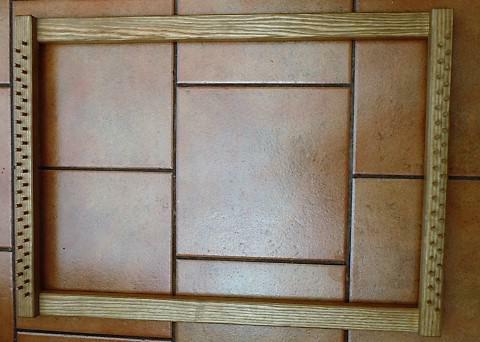 Check that the dowels are facing each other as in the photograph below. The dowels may be glued and using fine sand paper smooth the tops to take off the edges. Cut the four Tenon’s carefully on the ends of the side pieces. The frame can now be assembled by gluing and screwing. This will give a firm rigid structure. The next part is to make the underslung heddle holder. This is made from two pieces of wood both 56 x 2.5 x2.5cms. Their length must allow the holder to fit easily between the sides of the frame. You may have to reduce the length accordingly. One piece requires a groove down the centre to accommodate the dowels. The other holds the dowels, 2.5 cms (1 inch) apart. There is no need to take the dowels across the entire length, start and stop them 4 cms from each end. Add an extra-long dowel on each side to act as a locating aid. Take care that the dowels are set in a position that the grooved section will close complete and trap the heddles in position. Read the instructions for threading the loom as this will make things a little clearer. Note that the two pieces are bolted together with a couple of approx. 4mm bolts with wing nuts. The positioning of these must be within the width of the main frame so they will not catch on the sides. Making the groove does require a special tool and some skill. Look closely at the photos. The treadle piece, 47 x 3.5 x 1.5cms, requires a hole drilling at one end for the cord. The tension stick is the full width of the main frame, 56 x 3 x 1cms and needs any sharp edges removing. The shed stick, 46 x 3.5 x 1 cms must fit easily between the two sides and it too must be smooth. The two cross sticks, approx 56 x 1 x .5 cms must also be smooth. A couple of stick shuttles completes the task. These are easily made just ensure they are smooth and not over long. I use shuttles about 30 cms in length. All components are now complete, check all the photographs and consider how the whole assembly might look. There is no need to give the wood a varnish or a similar finish but I like to use a wax to feed the wood and which helps to avoid stains.